The proper disposal of expired or unwanted medicines helps maintain the quality of the water in the Potomac River. The presence of trace levels of pharmaceuticals in waterbodies nationwide has been documented and widely reported. Although there is no reported evidence to date of any adverse human health effects at these levels, common sense suggests that we ought to rethink our medicine disposal practices. Flushing unused medicines down the sink or toilet was once the recommended means of disposal, but alternative methods are now recommended to protect the environment and drinking water sources and limit misuse and poisonings. One of the best ways to dispose of unwanted medicines is through local take-back events. 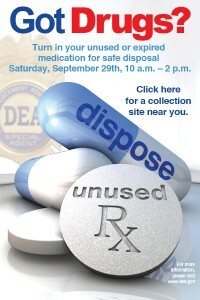 These events ensure the legal and safe collection and disposal of pharmaceuticals. The Drug Enforcement Administration (DEA) sponsored the first nation-wide event in September 2010. Each state has specific rules and guidelines for collection and disposal. Anyone interested in organizing an event should contact the appropriate state and local officials. Other options for disposal may include mail-in or take-back programs provided by a pharmacy or a pharmaceutical company, or a household hazardous waste collection event. To dispose of your own unused medications, contact your local waste management agency or other appropriate agency. Links are provided below for more information on disposal in the Potomac Drinking Water Source Protection Partnership’s member jurisdictions. The Partnership’s Emerging Contaminants Workgroup and Government Committee have both been active in efforts to encourage proper disposal. Assistance in the coordination of take-back locations in the Potomac River basin as part of the DEA’s September 2010 and April 2011 nationwide take-back events. Support of proper disposal legislation. Drafted comments on the Drug Enforcement Administration’s request for input on the disposal of controlled substances by persons not registered with DEA in March 2009. The comments were submitted by ICPRB on behalf of the Partnership. Partnership members participated in discussions with EPA’s Office of Ground Water and Drinking Water regarding the establishment of a safe medicine disposal project in Frederick County, Maryland as a pilot for the Potomac River basin. Continue to reach out to and support local take back efforts when possible. Below are links for information on pharmaceutical disposal from the Partnership’s members, local jurisdictions, and related efforts within the Potomac River basin. Contact the Interstate Commission on the Potomac River Basin if you have updated or additional information. – Jefferson County, W.Va. – Drop off box at the Jefferson County Sheriff’s Department. Call 304-728-3205 for more information. If you are interested in receiving more information on proper disposal of pharmaceuticals in the Potomac River basin, the links between pharmaceuticals and drinking water, or would like to help by educating the public or publicizing an event, contact your state or local waste management agency. Members of the Partnership’s Emerging Contaminants Workgroup may also have additional information or can direct you to an appropriate contact.